CALL FOR EMERGENCY SERVICE 24/7! For 40 years, home, business, and automobile owners throughout the area have turned to A J A Lock & Key for superior locksmith services. From fitting your home or business with a new lock to repairing an old one, you can count on us to get the job done at a price you can afford. High security or regular, electronic and keyless top or bottom lock for residential or commercial by brands we trust - Mul-T-Lock, Schlage, Yale, Medeco, Baldwin. We all have something to hide and valuables we want to keep therefore we offer safes for everyone by -Gardall, Amsec, Sentry, Mesa. No more lockouts. Enter your home or business with keypad code or use your smart phone to allow access. A.J.A. Locksmith carries a complete line of doors that we cover every need you have Commercial or Residential. Control who can unlock doors and gain entry to specific locations by person, day of the week, and time of day, using biometric or proximity devices. We service a wide range of intercom systems. See and talk to your visitors and grant access locally or remotely. At our locksmith company in Manhattan, we pride ourselves on our ability to provide nearly any locksmith services you need. 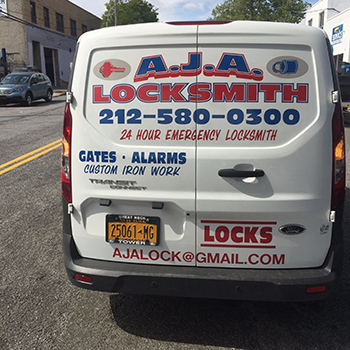 From lock installations to security window installations, A J A Lock & Key does it all for home, business, and automobile owners throughout the New York metropolitan area. When it comes to locksmith services, our professionals keep up-to-date with advancements in the industry to ensure your satisfaction. Put our extensive knowledge and experience to the test. We're confident that our locksmith company will meet your needs with prompt and personalized service. Fast, professional, truly a local Upper West Side business and not some “guy-in-a-truck” search engine scam. Highly recommended. A true gem of the UWS. This little shop will fix you up with exactly what you need and at a fair price. Jimmy helped teach me how to install a new doorknob versus bringing someone out to fix it, obviously saving me money. He went above and beyond to teach me how to install the doorknob and gave me a good pep talk to boot! I hope I don’t break my doorknob again, but if I do, I will undoubtedly be going there again. I needed to get three keys copied. Came in and was out in less than five minutes! The service was great. The guy was super friendly and helpful. The keys were duplicated in no time and they were definitely inexpensive compared to other places I’ve been to. Don’t go anywhere else, especially if you live in the area. There’s no need. AJA is great, quick, and the keys worked great! WE’D LOVE TO HEAR FROM YOU! CONTACT US!